Apple Cinnamon Waffles. Every weekend we try to make waffles. You can never have too many healthy waffle recipes. Today we made healthy apple waffles with lots of cinnamon! We usually make Blueberry Oatmeal Waffles or Strawberry Banana Waffles. The last couple months, my daughter had soccer early in the morning, so we had to rush out quickly with no time to make waffles. This past weekend, we were finally able to again. My daughter requested apple cinnamon waffles, so here you go. You can use all white whole wheat flour if you want. I just like to mix it up with some oat flour. This recipe is super easy and could probably be easily converted into pancakes as well. It will make your house smell amazing too! I always make a big batch and then freeze some. Then you can easily pull one out and toast it on those busy mornings! Preheat your waffle iron . Add we to dry and mix until combined. Using a 1/2 cup scoop, spoon mixture onto a greased waffle pan. Repeat these steps until all are made. I got 5-6 waffles out of my batch. Enjoy! Melissa, these sound so yummy! I love that you suggest to make extra so that you can freeze some. I find that's such a time-saver on busy mornings - a great way to make sure your family eats a healthy breakfast even when you're in a rush. Great tip! Glad it could help Shelley! I hope you enjoy the recipe. Mmmmm ... sounds amazing! I've seen cinnamon sugar waffles at the store, but I wouldn't have to worry about all the extra 'stuff' that goes into them! Can't wait to try!! Thanks Colleen! I am happy you liked them! This recipe sounds wonderful. I don't own a waffle iron, so I'd have to make them as pancakes. I would add some protein powder to them, so they could make a complete breakfast for me. I love finding new breakfast recipes. Thank you! I hope you enjoy them! They would make great pancakes! Can we replace the wheat flour/oat flour by coconut flour or tapioca or almond flour? You can, but add a few more eggs. It's different from whole wheat. It's still a whole grain, but lighter in taste and texture. You can use whole wheat flour or spelt flour, but the texture will be a bit different. My grocery store doesn't carry a lot of 'weird' stuff, but it does have this flour. The one I've found is made by King Arthur Flour, and you can get it online if you can't find it in a grocery store. It should be on the shelf with the other flours. Those look delicious! Breakfast is always a battle in our house before school- I'm giving these a try! Do you know there's an ad on your page for fig newtons, the very product you've blogged about/against? No, I thought I blocked all those out. Thanks for letting me know. You're welcome. Well, hopefully I at least made you a little money by clicking on it to see if I was seeing right ;). You're welcome Rene! Glad you liked them! PS. I know you like to use maple syrup, but my guys don't like it (weird, I know). So, I've always made my own out of white and brown sugar. Since I'm getting away from those sugars, I was wondering if I could make syrup from coconut palm sugar. I just found a recipe from Sharon Kaufman for one. I'm excited to try it and thought I'd share it with you and your readers. Coconut Palm Sugar Pancake Syrup 4 cups granulated coconut palm sugar 2 cups filtered water 1 tablespoon natural maple flavoring (I use Frontier brand - see photo) 1 tablespoon stevia extract or to taste (optional) pinch real sea salt Directions: Combine all ingredients in a medium saucepan and heat just until sugar is dissolved (do not boil). Serve warm syrup over pancakes, waffles, etc. Made these last night and they were a hit! My daughter that doesn't even try most of the "healthy" recipes that I make likes them! Thanks so much! You are so welcome! Glad they were a hit! Could honey or maple syrup (or another sweetener) be subbed for the sugar? I don't have any on hand and these sound great for breakfast! Melissa you are by far a huge huge inspiration in this family! After my son was searching your recipe box he came to the conclusion that we had to have a waffle iron. He has printed out all your waffles recipes, and most of your meals. He has become a little chef an you are his inspiration! Thanks so much!!! Melissa, I've never made one of your recipes that didn't turn out amazing, but I'm surprised these do not need any baking soda or powder to rise? Oops I meant to post on the gluten free apple waffles! Weird! There was supposed to baking powder in it and I guess I forgot to add it in the instructions. It must be okay without though too. No one has ever complained about this recipe haha! I'm new to this site and eating. 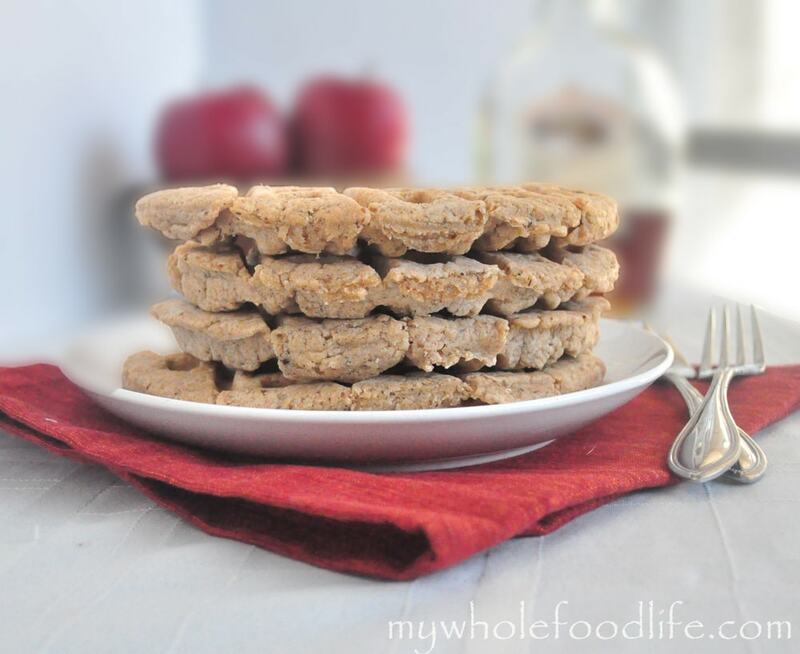 I cannot have wheat or oats so do you think you could make these with all the same flour(tapioca flour)? Will it come out okay? I have never used tapioca flour, so I am not sure. Maybe try gluten free all purpose? Hi, I have a question about a recipe. So the recipe is using two eggs and a banana and then whisking to create a pancake batter. Could you use flax eggs? And if so, how many?